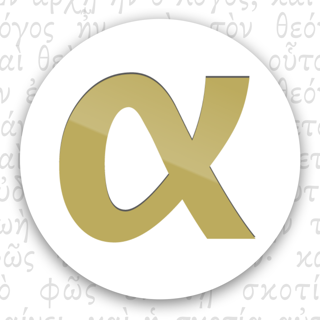 • Over 1000 verses preloaded - two complete five-year collections of verses. 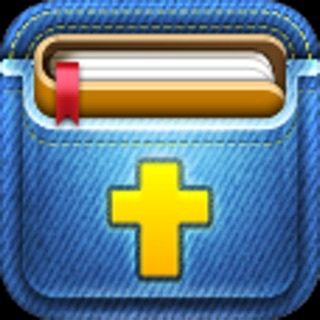 • Add ANY VERSE you want using "My Verses" and organize them using topics, tags, and categories. Add verses in ESV instantly; easily copy/paste other translations from BibleGateway.com. • ELEVEN Bible translations - ESV, NIV 2011 (additional cost), NASB, HCSB, CSB®, KJV, NKJV (additional cost), LBLA (Spanish), RVR60 (Spanish, additional cost), SG21 (French), LB2017 (German, additional cost). • REVIEW function presents memorized verses at customizable graduated intervals (daily, weekly, monthly or biannually) for long-term retention. • FOUNDATION VERSES collection, which are verses for young children. This is an amazing tool to help children memorize; each verse has a picture to help children identify the verse. 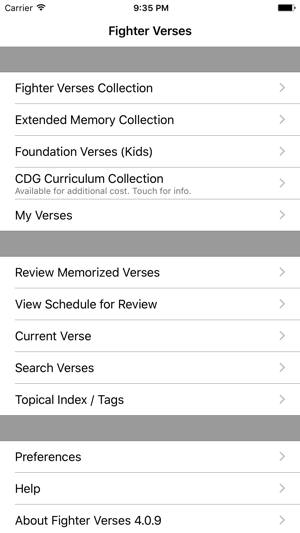 • CURRICULUM VERSES are available as an in-app purchase for our Kindergarten through 6th grade Sunday School curricula. 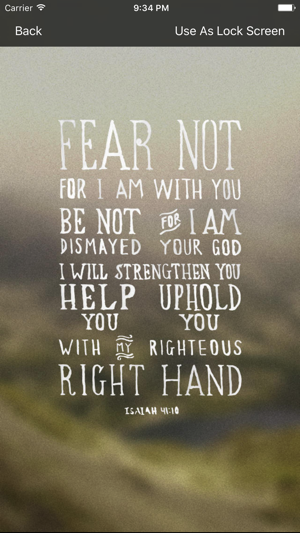 • Display verses on the LOCK SCREEN so the verse is front of you every time you use your phone / tablet. This app works on iPhone, iPad, and iPod Touch. All verses are available for offline viewing. 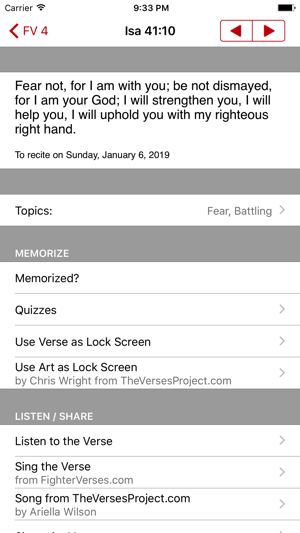 With the Fighter Verses App Bible memory has never been easier. 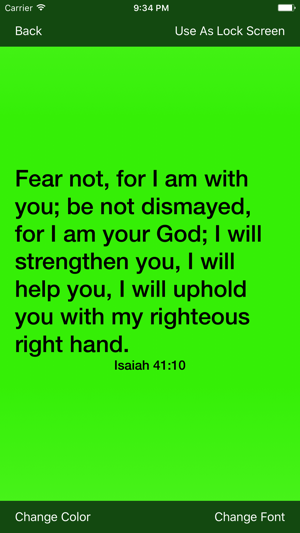 With these tools even people who have previously been unsuccessful at memorizing Bible verses can be successful. When using the "Listen to the Verse" feature for Bible translations other than ESV the app will now default to having Siri speak the verse to save you the time of recording it, but making your recording still allowed as an alternative. I just started with this app and I love the built in memory aids! Some of the songs are hard to memorize as they clump long phrases together. If you do all the quizzes, you will have the verse memorized. My only complaint so far is that I can’t sync between my iPad and iPhone. I get review notices on both, which I know I can change, but it would be nice if I didn’t have to check memorized on both. It’s not a big deal yet because I've just started but with lots of verses under my belt it could be confusing. Also, if I add a Peru verse on one, I have to remember to add it to the other. Not sure what the iCloud issues are on this app but I would highly recommend figuring it out. We're so glad the memory tools are helpful. We appreciate your comments and are continuing to work toward a syncing solution. Please pray with us on this. Thanks. Scripture memory is incredibly important, especially for our children. I’m am so thankful for the verses I was made to memorize as a child and student: the Lord uses those verses by bringing them to mind all the time. Despite knowing this, I struggled for many years to consistently memorize and review Scripture with my own children until a friend recommended this app. 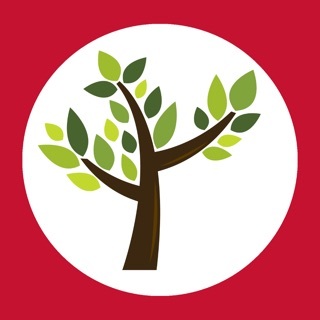 The FighterVerse app puts Scripture to music and includes quizzes and review. 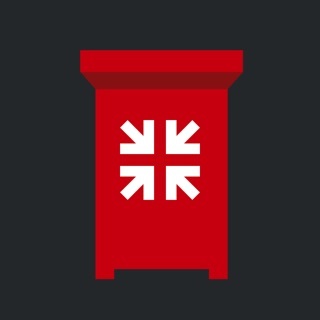 Using this app has revolutionized our Scripture memory. You will not regret investing in the $2.99 FighterVerse app! We're so glad you're finding this tool helpful for you and your family! God's Word is powerful and important in our daily lives. Thanks for taking the time to encourage others in your comments. Thanks for the suggestion. We've added it to a list for the development team to consider. Previous: When in the current verse you can go to the next verse via the arrow at the top. If you want to permanently adjust the verses that come up, you can change the start date in Preferences. Contact us directly if you have more questions or suggestions; we're happy to help. May the Lord bless you as you memorize His Word.